Rate this project The first release candidate of KANOTIX 2006-01 is ready for testing: "Kano has released KANOTIX 2006-01 RC1. KANOTIX is a Linux live CD based on high compression technology initially pioneered by KNOPPIX, but using mostly pure Debian 'sid'. Specifications: kernel 2.6.17.13 with many patches; ACPI and DMA enabled by default; i586 optimization; 192 MB RAM required, 256 MB RAM recommended; Unionfs support (with 'unionfs' cheat); NTFS-3g support; AVM Fritz!Card DSL support; KDE 3.5.4; ALSA 1.0.11rc4; GRUB boot loader for CD start - ideal for rescue in command line mode; Memtest86+ advanced memory diagnostic tool in the extra menu of the boot loader." Read the release notes for further information. 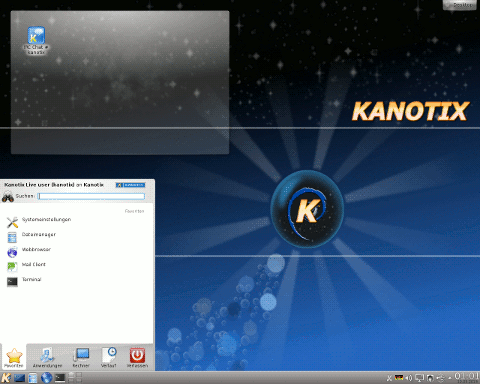 Download: KANOTIX-2006-01-RC1.iso (698MB, MD5).